Click image to enlarge Mount Hood from Highway 26. 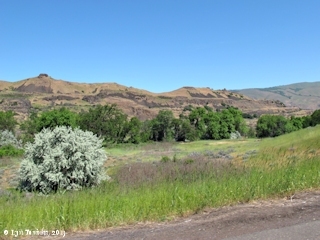 Parts of Highway 26 follow the old Barlow Road, part of the Oregon Trail. Image taken August 16, 2009. The standard date for departure from any of the jumping-off places was April 15 - give or take a week or two, with expected arrival in Oregon or California hopefully by September 1, but not later than October 1. An ideal crossing was 120 days, April 15 to August 15, a daily average for the 2,000 mile long trail of 15 miles per day, a typical crossing took about two weeks longer. On a good day more than 15 miles could be covered, on a bad day, much less." Source: U.S. National Park Service, Whitman Mission, Oregon Trail Teachers Guide. 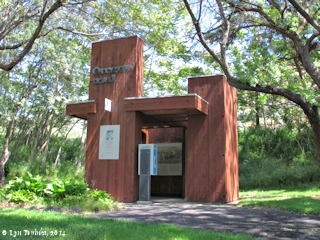 In 1978, the entire Oregon Trail, including the Barlow Road, was named a National Historic Trail by the U.S. Congress. The Trail crosses through six states -- Idaho, Kansas, Missouri, Nebraska, Oregon, and Wyoming. 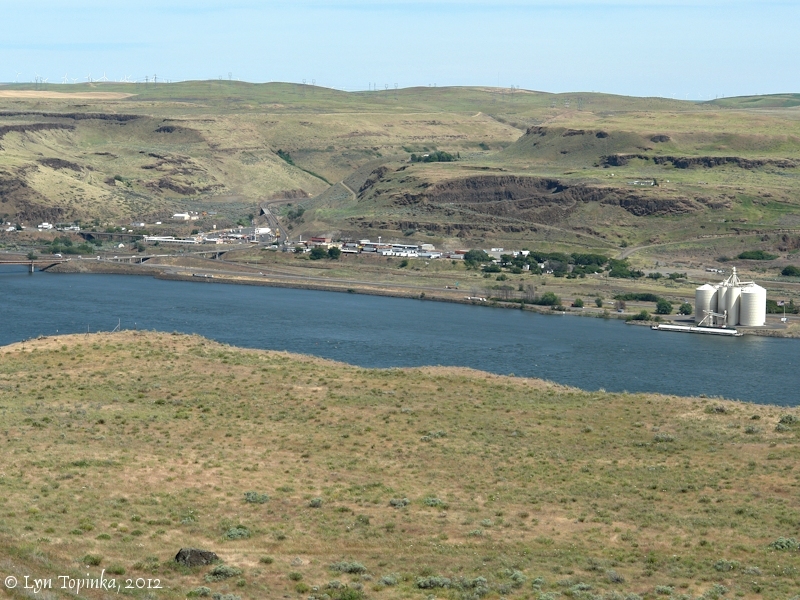 Click image to enlarge Oregon Trail below Signal Hill, east of The Dalles, Oregon. Information via volunteer guide, Horsethief Lake Park (Columbia Hills State Park), Washington. Image taken October 15, 2011. 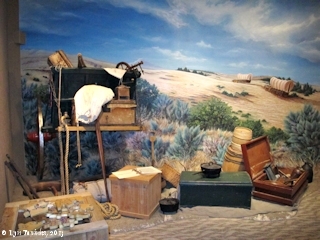 Click image to enlarge Oregon Trail kiosk at Government Camp. 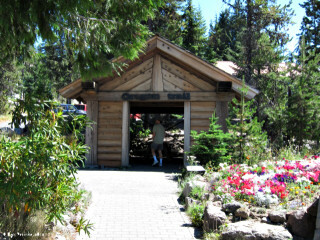 Image taken August 14, 2012. "A prairie schooner is a relatively small covered wagon averaging 10-12 feet long and 4-5 feet wide. 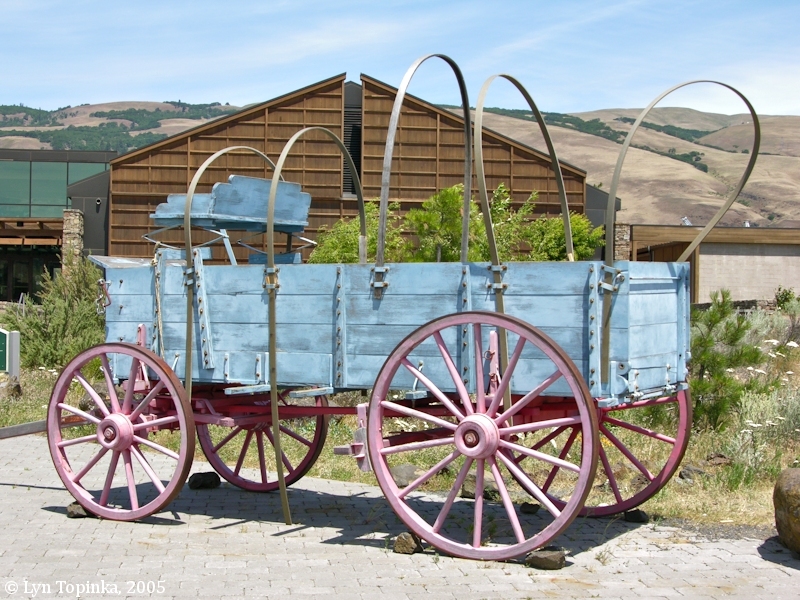 Most were converted farm wagons, although a few individuals such as freed slave Hiram Young and the Studebaker brothers made a living crafting wagons in Missouri for the Oregon Trail. 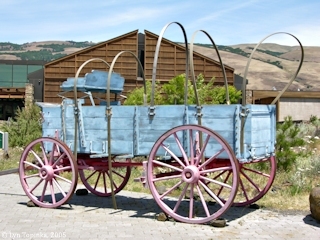 Older and larger Conestogas were built for the freight trade on the National Road or Santa Fe Trail. 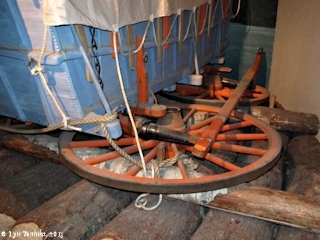 Some early pioneers tried these large wagons on the Oregon Trail but soon discovered they were too heavy for their teams to cross the Rockies." 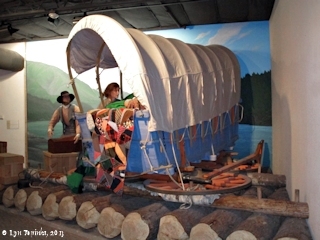 Source: Jim Thompkins, 1996 and 2002, "Discovering Laurel Hill and the Barlow Road"
Click image to enlarge Prairie Schooner, Columbia Gorge Discovery Center, The Dalles, Oregon. Image taken June 4, 2005. "... 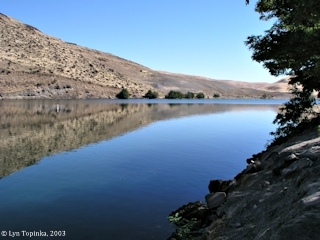 The main route generally followed the Snake River across much of southern Idaho. 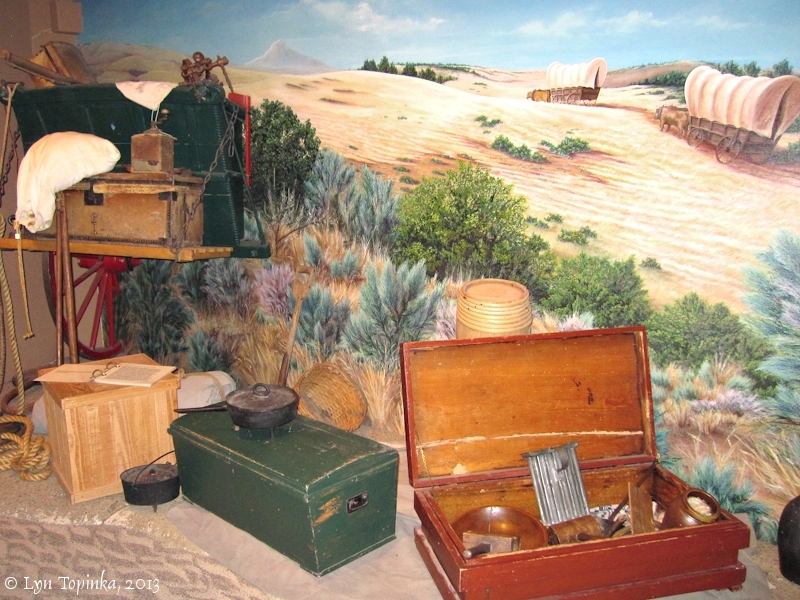 At the place called Farewell Bend, near Ontario, Oregon, the pioneers veered away from the Snake River, bidding it farewell as the name implies, and struck out overland across the Blue Mountains. 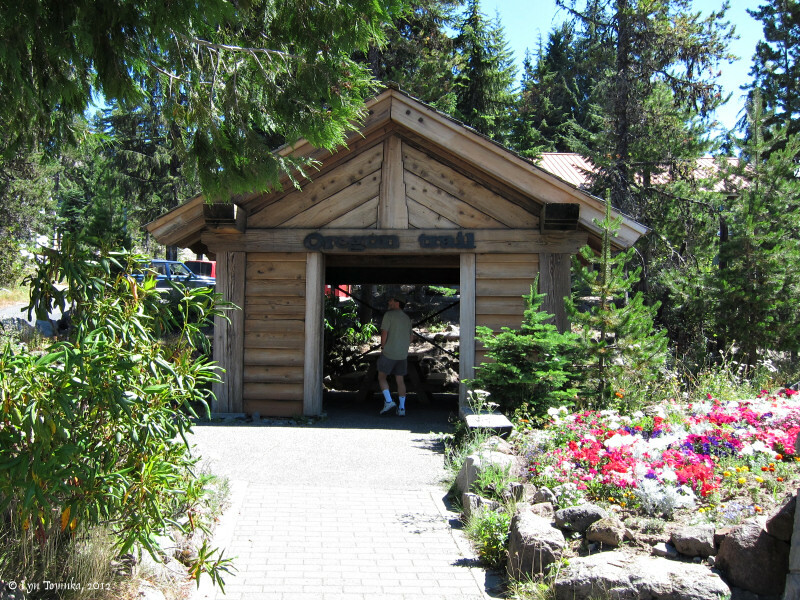 Arriving at what is now the City of Echo, Oregon, the trail took several branches. 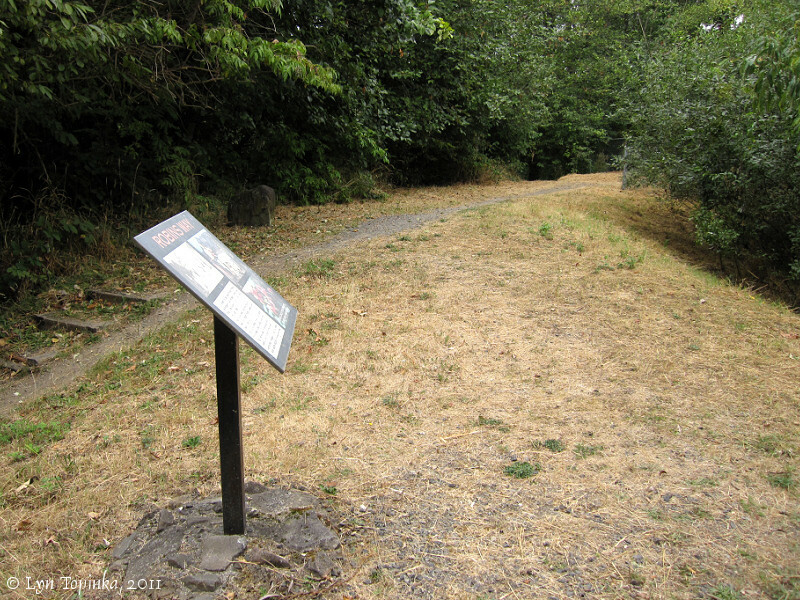 The main trail proceeded westward through a stage stop called Well Springs and then onward to the Columbia River near The Dalles. 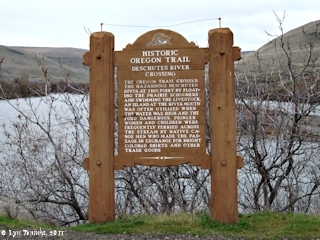 Another branch of the trail followed the Umatilla River from Echo down to its confluence with the Columbia River at what is now the City of Umatilla. A third branch traversed down through present-day Umatilla Army Depot and joined with a Columbia River shoreline trail here at Irrigon. 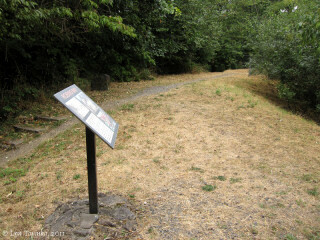 This trail segment intersects almost exactly at the campsite of the Lewis and Clark Corps of Discovery, thus the city logo “Where Lewis and Clark & the Oregon Trail meet”. 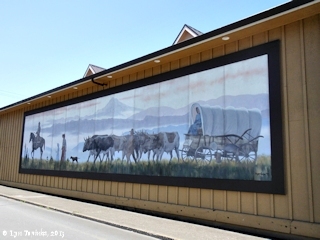 ..."
Source: City of Irrigon website, 2014, "Irrigon History"
The main route of the Oregon Trail passed approximately eight miles south of today's community of Arlington, staying on the plateau before dropping into Alkali Canyon and heading west to the John Day River. 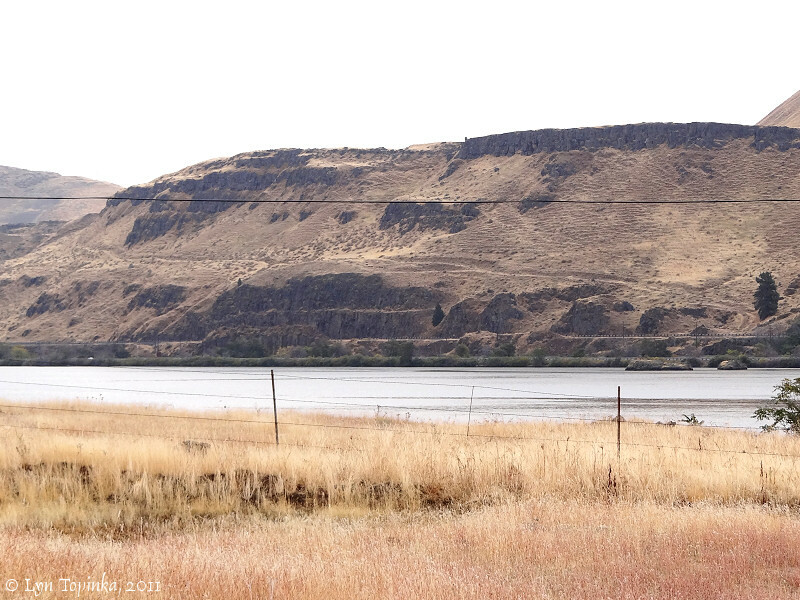 Many wagons however turned north at Alkali Canyon, reaching the Columbia River at the location of today's Arlington. 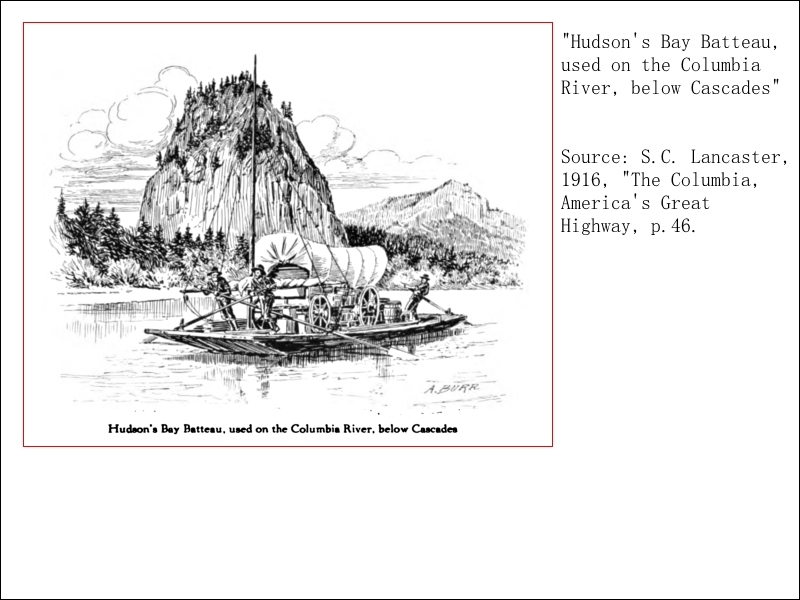 From there the settlers rafted down the Columbia in Hudson's Bay Company bateaux (boats) or Indian canoes. 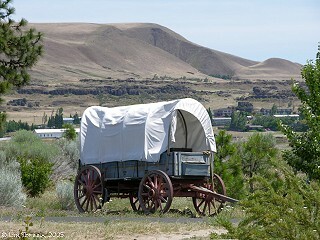 The Oregon Trail wagons crossed the John Day River approximately 20 miles upstream from its mouth, at a flat location known as "McDonald Ford". Later this was to become a ferry location. 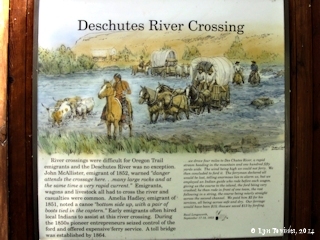 "After three days of sand, rock, blustery winds, and shortages of wood and water while crossing the Columbia Plateau, emigrants were relieved to arrive at the John Day River. 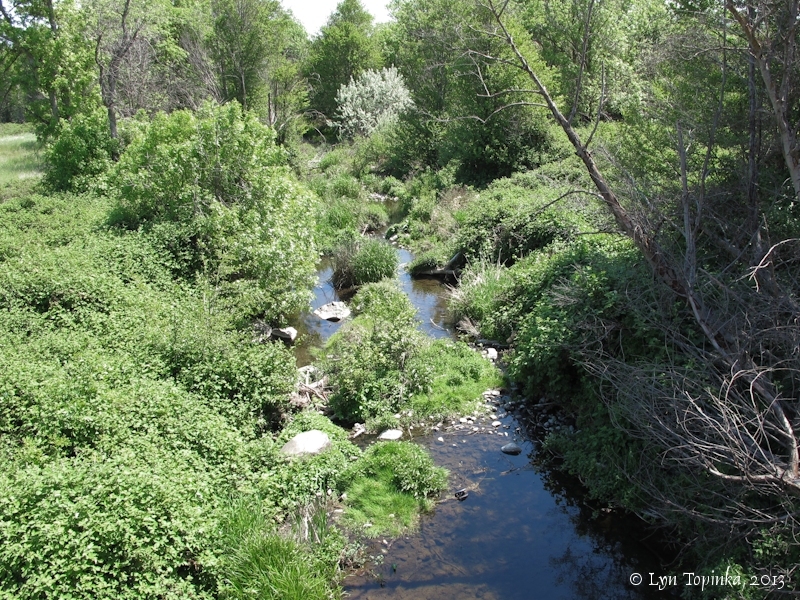 This was the first of several major rivers flowing north toward the Columbia that would have to be crossed, but the McDonald ford provided an easy crossing. The river is normally only 8-12 inches deep during late summer, and the ford has a smooth, pebbly bottom. 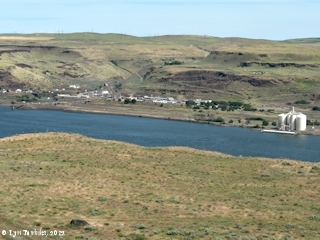 Esther Belle McMillan Hanna arrived at McDonald Ford on September 1, 1852: We had a very steep hill to descend in coming to it [John Day River]. ... We have encamped on the river bottom, which is large and very level. Will remain here until tomorrow to rest our cattle and ourselves and conclude on the route we will take." 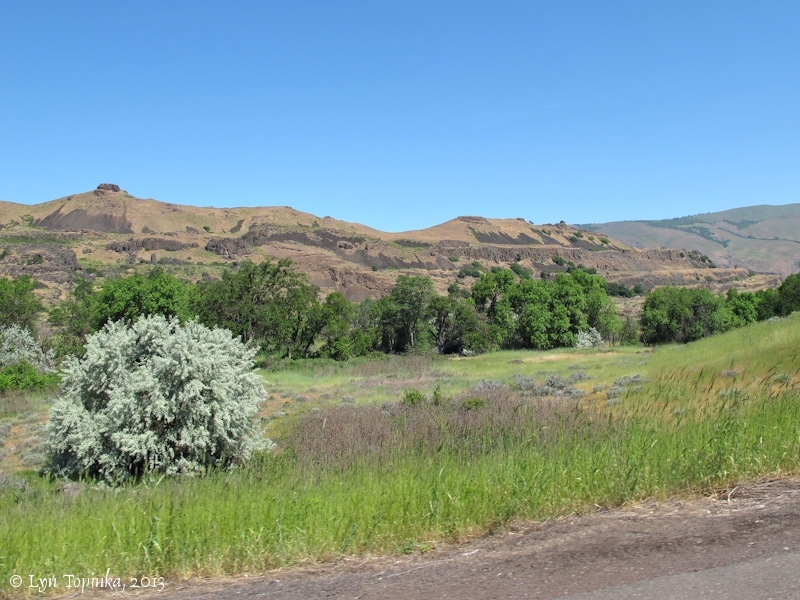 After ascending the west side of the canyon -- "one of the most difficult hills have have met on the whole journey across the plains" -- emigrants could take the right fork of the trail to go the the Dalles, or, after 1848, they could take the left fork and follow a cutoff to the Barlow Road." 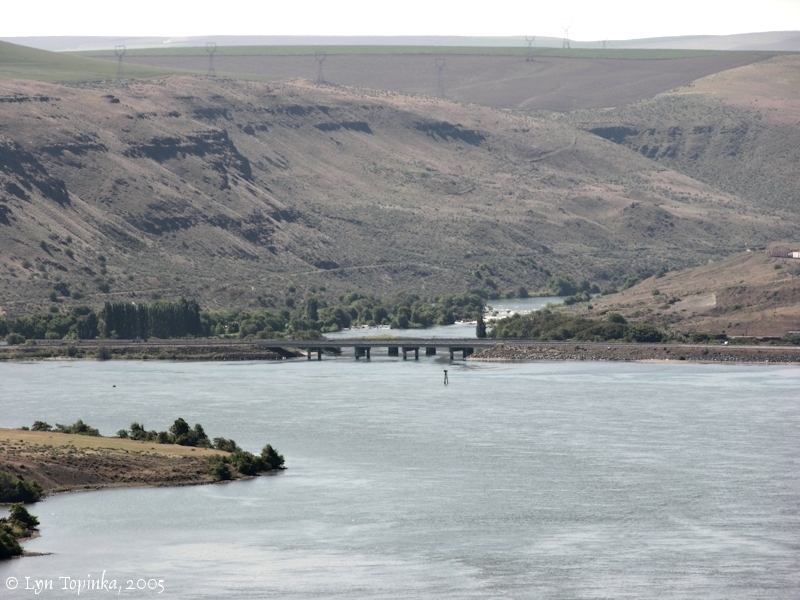 "After crossing McDonald Ford, the Oregon Trail slowly wound its way through the hills towards the Columbia River. 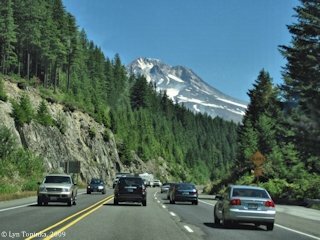 About 25 miles west of the ford, emigrants abruptly toppped a ridge and saw spread out before them the magnificent Columbia River Valley, with Mount Hood rising from the western horizon. 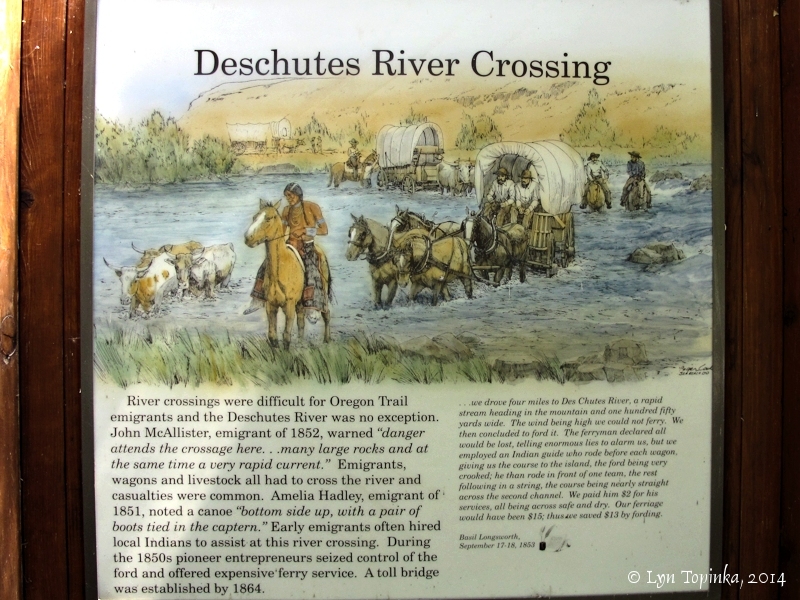 This was one of the most impressive and joyful sights along the trail, for the Oregon country was finally beginning to resemble its publicized beauty, and reaching the Columbia River meant the long overland journey was almost at an end. Michael Fleenen Luark wrote on August 23, 1853, "4 miles further we reached the Columbia river for the first time after going down a long but not a steep hill. ... the river is quite low at this time leaving large banks of beautiful white sand showing that the river is extremely high at some seasons of the year." 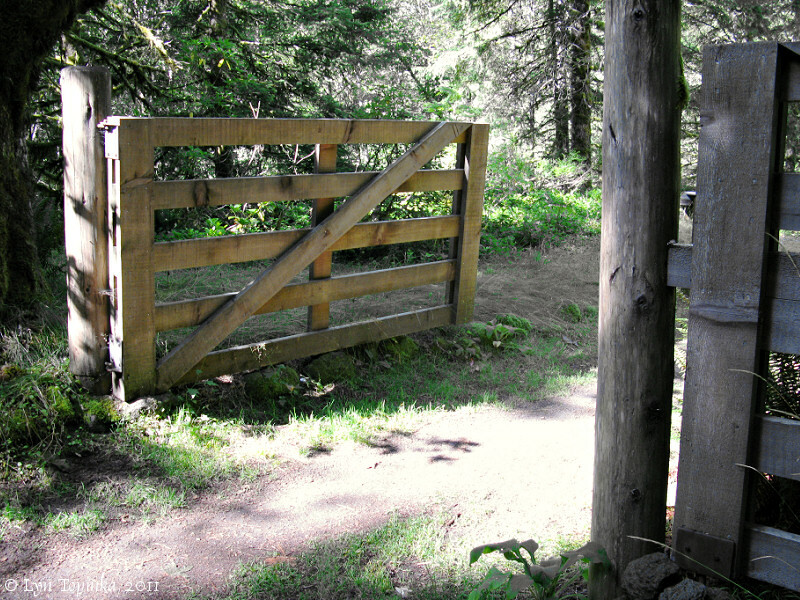 A one mile section of trail ruts cross a bench above Old Highway 30 west of the present-day town of Biggs Junction. 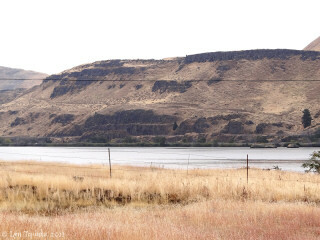 This is one of the last remaining stretches of the Oregon Trail along the Columbia River not destroyed by highway and railroad construction in the past century." Click image to enlarge Biggs Junction, Oregon, as seen Maryhill Museum, Washington. Image taken May 29, 2012. 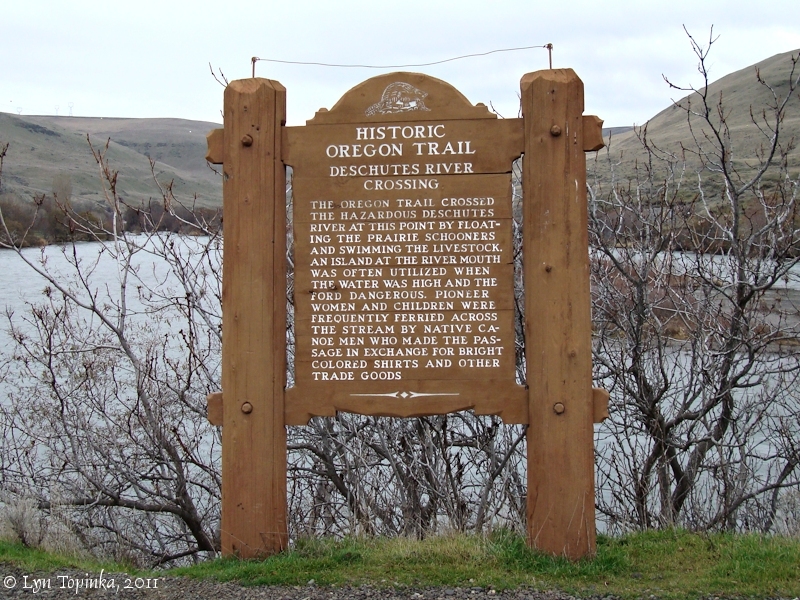 "Until 1846, The Dalles marked the end of the overland travel on the Oregon Trail. 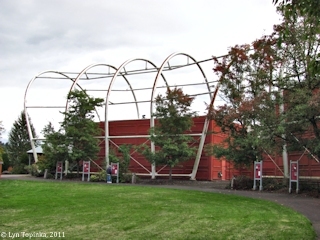 At the mouth of Chenoweth Creek, emigrants embarked on steamboats, rafts, or canoes for the 83-mile journey down the Columbia River to Fort Vancouver. 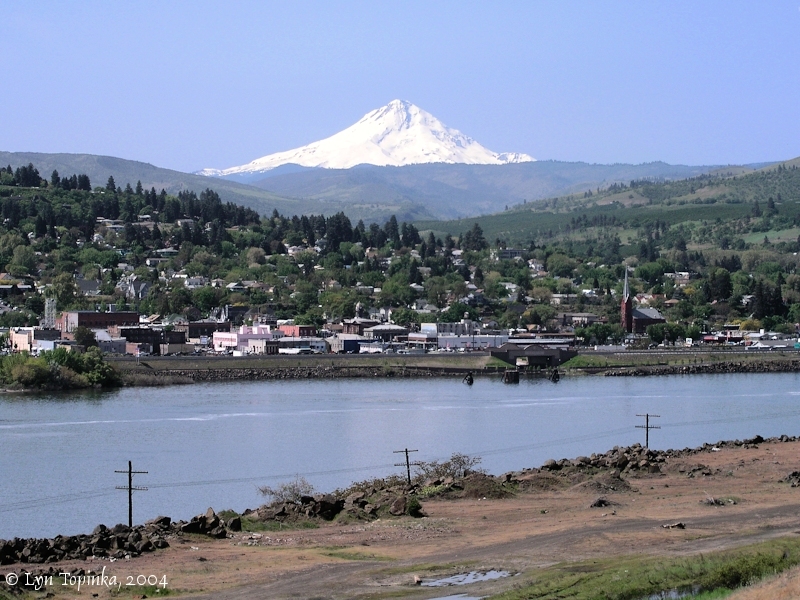 With the opening of the Barlow Road, emigrants at The Dalles faced a decision -- whether to float their families and wagons down the Columbia or to cross the southern flank of Mount Hood by wagon. Neither option was easy. Rafts and livestock were difficult to maneuver along the river's swift currents and the Barlow Road's steep and rocky grades made travel dangerous for exhausted livestock." Once reaching The Dalles, Oregon Trail travelers had to decide whether to take the "land route" and go around Mount Hood, or take the "river route" and raft down the Columbia River. The mural "Decision at The Dalles" was painted by Don Crook in 1992, and is located at E. Federal Street between 2nd and 3rd Streets, The Dalles, Oregon. 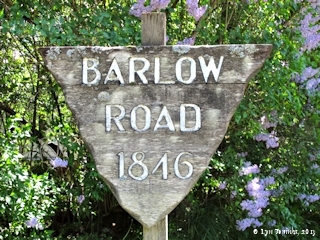 The Barlow Road is a part of the Oregon Trail, being established in 1845, making its way around the south side of Mount Hood. This road provided an alternative to the dangerous and expensive route that used rafts to transport wagons down the Columbia River. 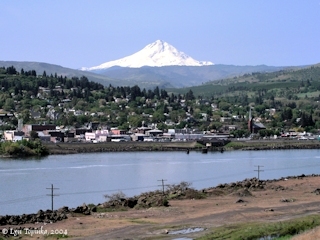 The Barlow Road began at The Dalles, headed south through Dufur and Tygh Valley, then turned west and north through Barlow Pass and Government Camp, passed through "Tollgate #5" and crossed the Sandy River, and continued to the community of Sandy, where it headed west and ended up at Oregon City. 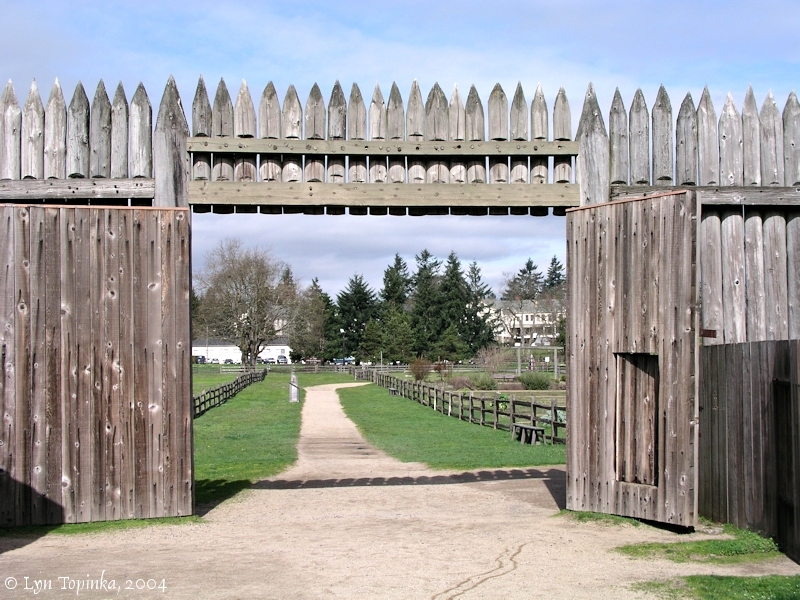 Click image to enlarge Tollgate Replica, Barlow Road, Rhododendron, Oregon. Image taken September 20, 2011. At the mouth of Chenoweth Creek near Crates Point, emigrants embarked on steamboats, rafts, or canoes for the 83-mile journey down the Columbia River to Fort Vancouver. 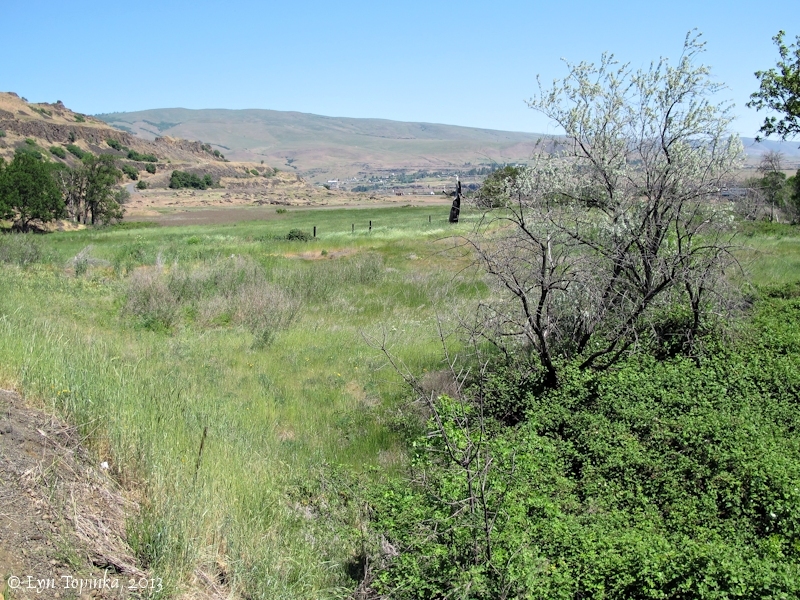 Click image to enlarge Chenoweth Creek drainage, The Dalles, Oregon. 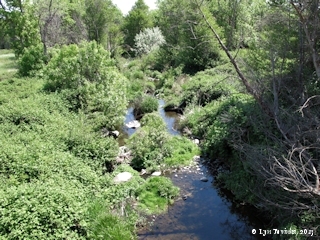 View looking west at the Chenoweth Creek drainage (trees), approximately 1/2 mile from the mouth of Chenoweth Creek. Image taken May 8, 2013. 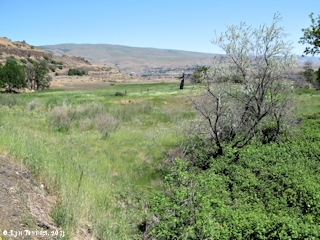 Click image to enlarge Flat area west side of the Chenoweth Creek drainage, looking towards the Columbia River. View approximately 1/2 mile from the mouth of Chenoweth Creek. Image taken May 8, 2013. 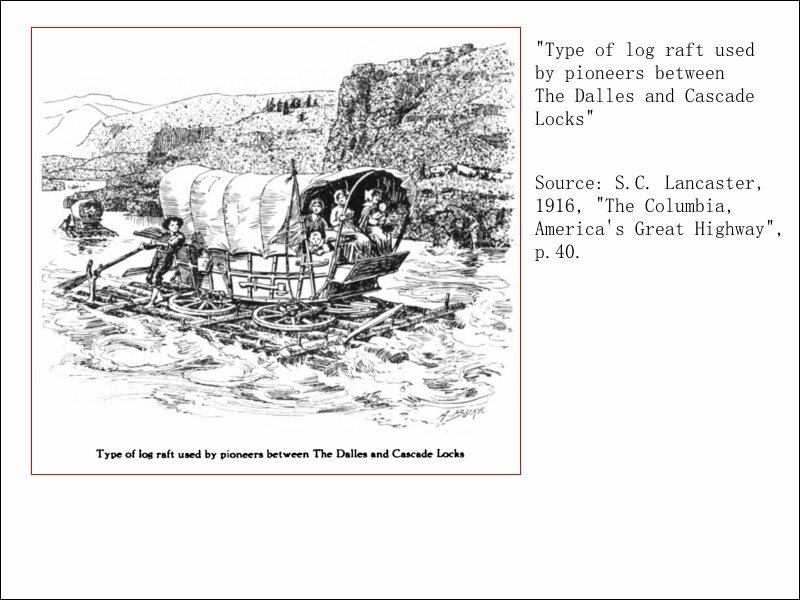 Click image to enlarge ILLUSTRATION: "Type of log raft used by pioneers between The Dalles and Cascade Locks". Source: S.C. Lancaster, 1916, "The Columbia, America's Great Highway", p.40. 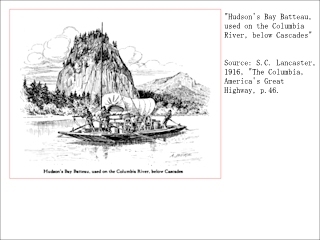 Click image to enlarge ILLUSTRATION: "Hudson's Bay Batteau, used on the Columbia River, below Cascades". Source: S.C. Lancaster, 1916, "The Columbia, America's Great Highway", p.46. 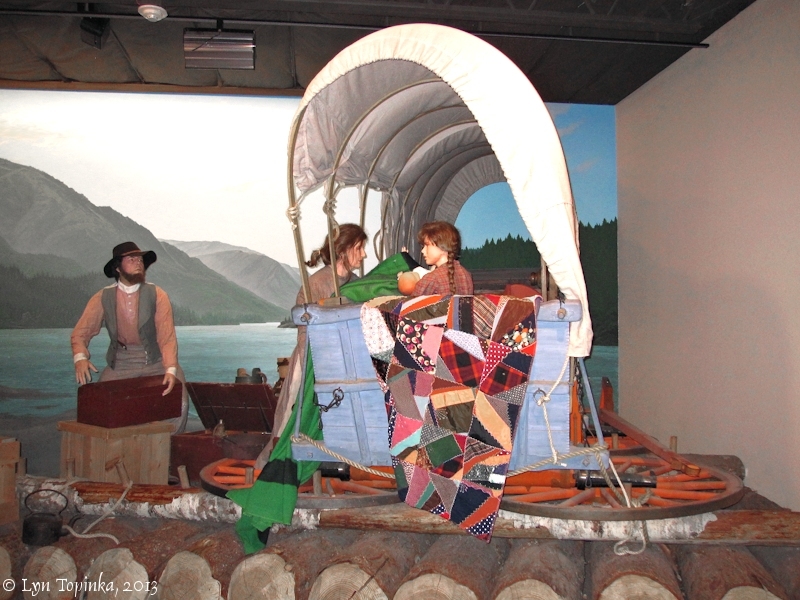 "While the men drove livestock along the river shore, women and children stayed with the wagons and floated the Columbia River as far as the Cascades. 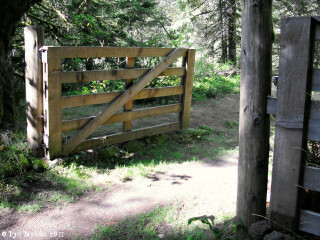 This was the last dangerous obstacle on the Oregon Trail for those traveling the Columbia River Route. ... Although these rapids were occasionally run with fully loaded boats, the practice was dangerous and fraught with accidents. 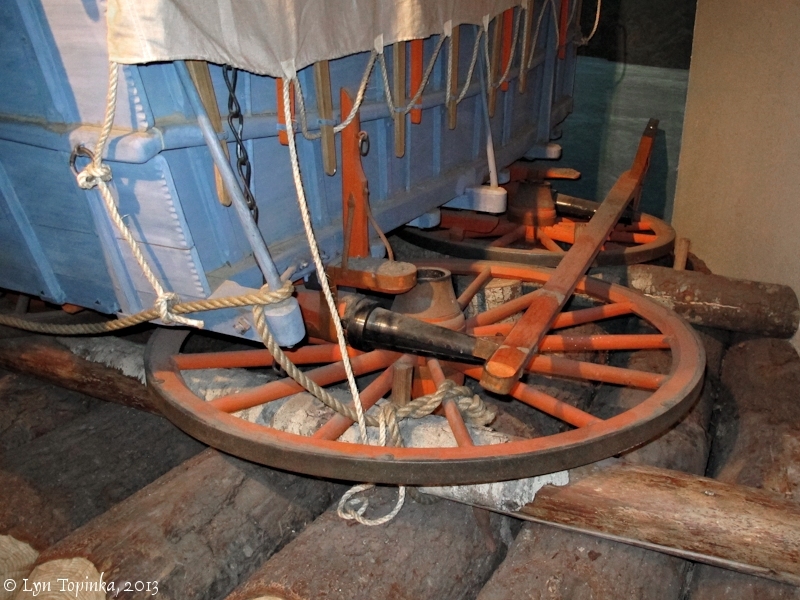 Most emigrants resorted to a back-breaking three to five mile portage. Local Indians helped the emigrants transport their loads until portage roads were built around the obstruction in the 1850s." 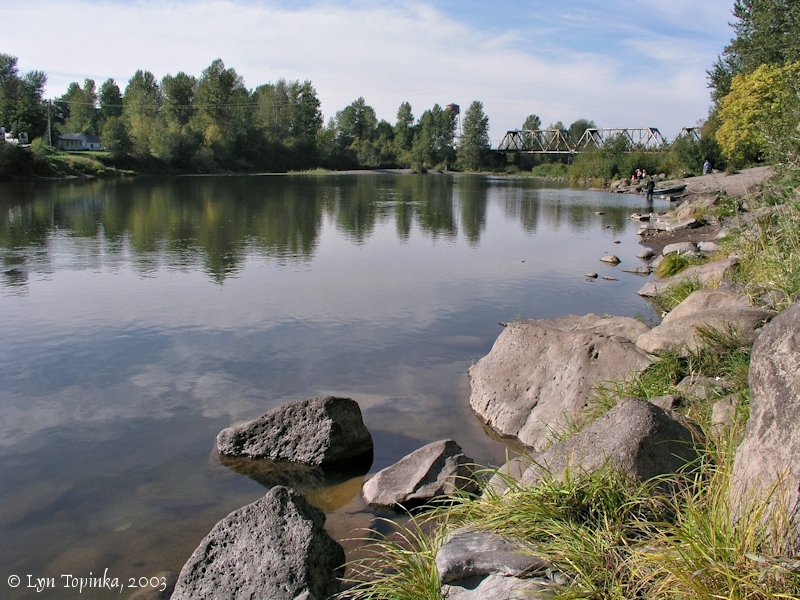 Click image to enlarge Sandy River, Oregon, near Troutdale, from right bank looking downstream towards Lewis and Clark Recreation Area boat ramp (on right). The boat ramp location was once the location of an Oregon Trail ferry across the Sandy River. Image taken October 18, 2003. 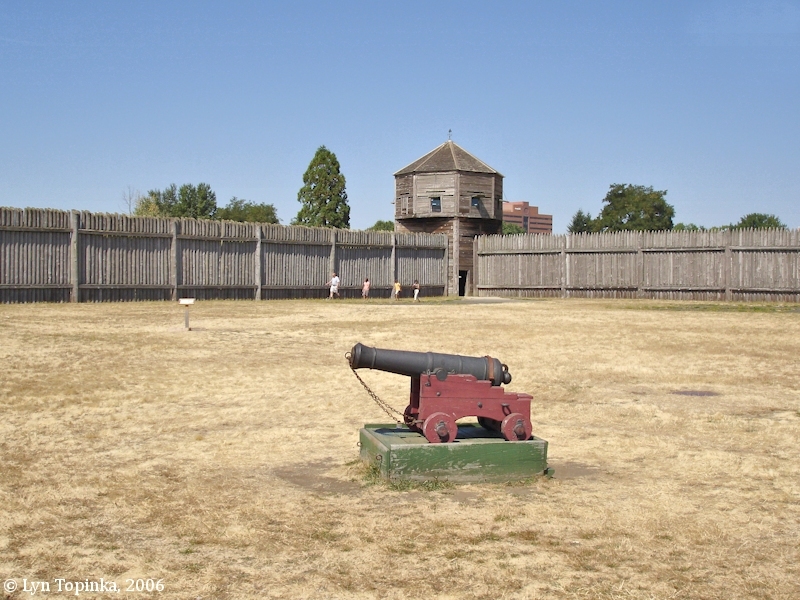 "Founded by the Hudson's Bay Company in the winter of 1824-1825 as a fur trading post and supply depot, Fort Vancouver was the most important settlement in the Pacific Northwest for more than 20 years. Dr. John McLoughlin, Chief Factor of the post until 1845, greatly assisted the exhausted, penniless emigrants who arrived at his doorstep. He helped them with transportation, lodging, subsistence, and even extended credit for supplies obtained at the post until they could raise their first crops." Click image to enlarge Fort Vancouver, Washington. 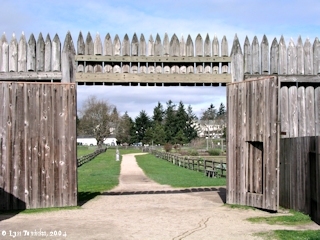 The fort's palisade was built not for protection of the fort, but to protect trading items from theft. View is looking out of the gates towards the Vancouver Barracks. Image taken March 7, 2004. 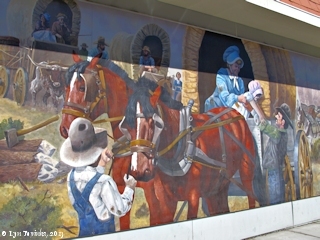 Oregon City, located approximately 15 miles south of Portland, Oregon, is considered the "End of the Oregon Trail". This is the home of the Oregon Trail Interpretive Center, a museum which provides information and "living displays" about the Barlow Road and the Oregon Trail. 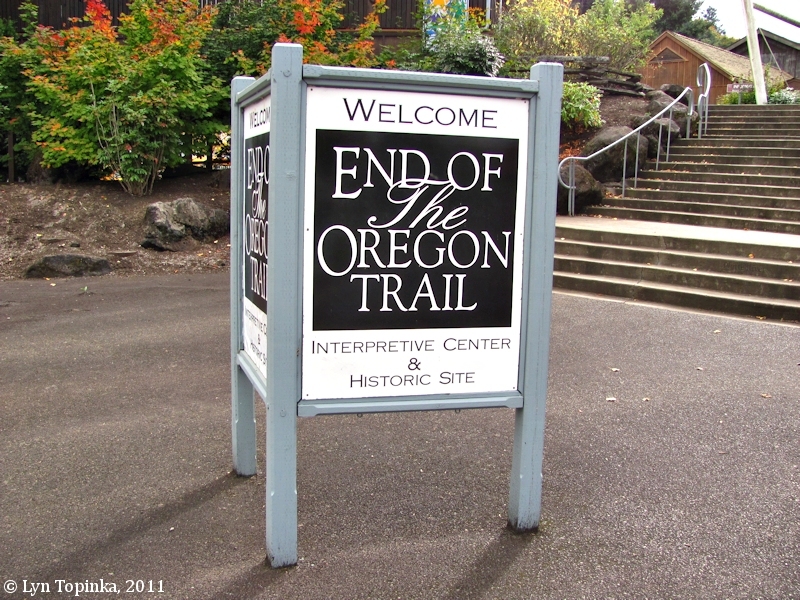 "The Oregon Trail officially ended at Abernethey Green in Oregon City. 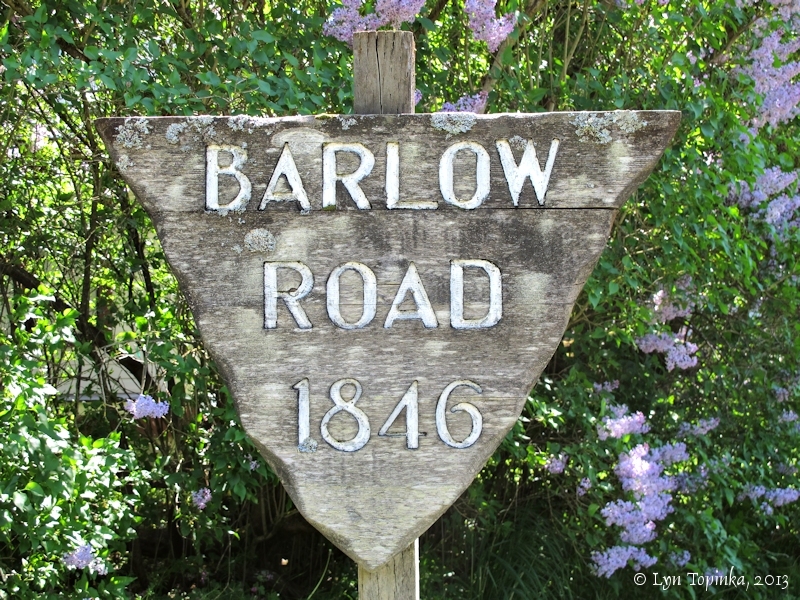 The town was not much to boast of in the 1840s. Maria Belshaw called it the "worst looking place for a City I ever saw." The town was started in 1842 by Dr. John McLoughlin, who chose the site because of its location next to the falls of the Willamette River. The falls prohibited water navigation farther south and provided power for McLoughlin's sawmill. From here, emigrants fanned out across the fertile Willamette Valley to the south in search of the new homes they had come so far to find. 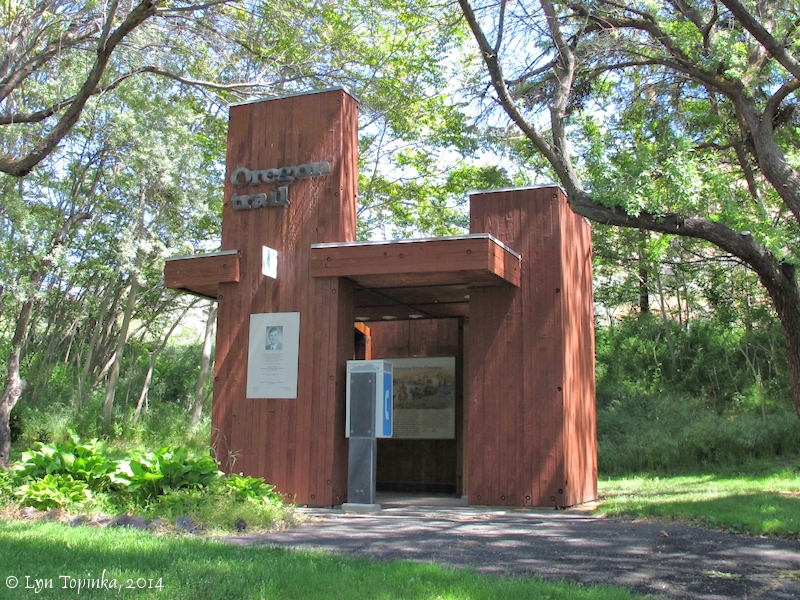 Today, the End of the Oregon Trial Interpretive Center is lcoated at Abernethy Green." 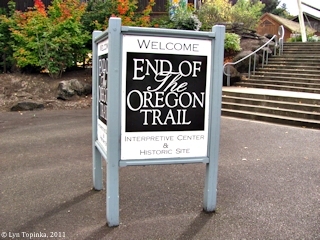 Click image to enlarge Sign, "End of the Oregon Trail", Oregon City, Oregon. Image taken October 22, 2011.